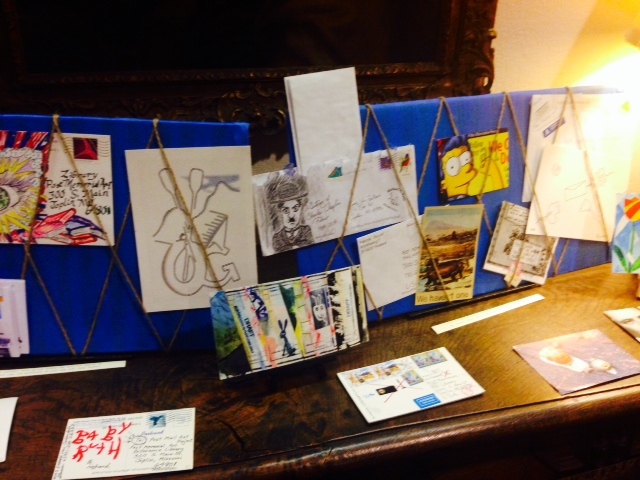 This afternoon, I had the privilege of attending a reception for the Mail Art Projekt Exhibit. 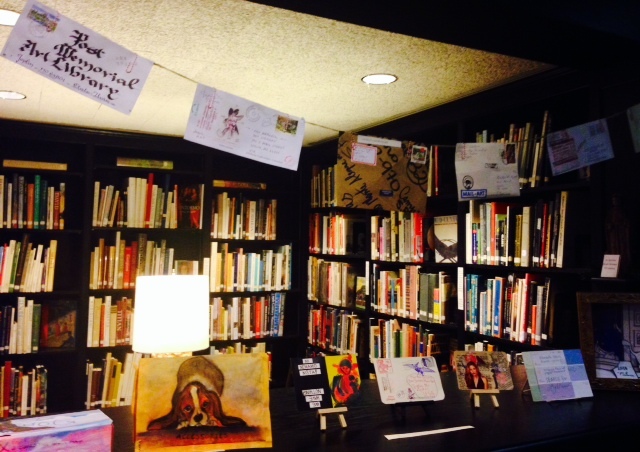 Located in the Post Memorial Art Reference Library, the exhibit features art pieces mailed in from around the world. Back on Day 330 last year, my grandson Dayan and I competed our entries for the Projekt and dropped them into the mail. 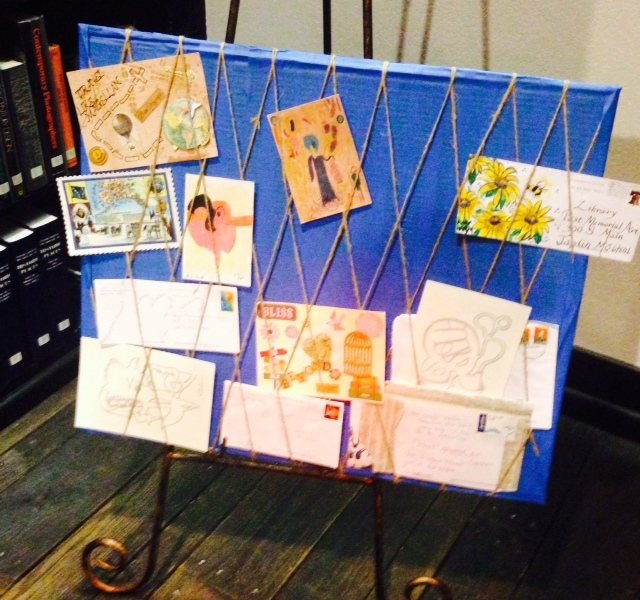 These postcard sized works of art were fun to create and we looked forward to seeing the pieces displayed this month. 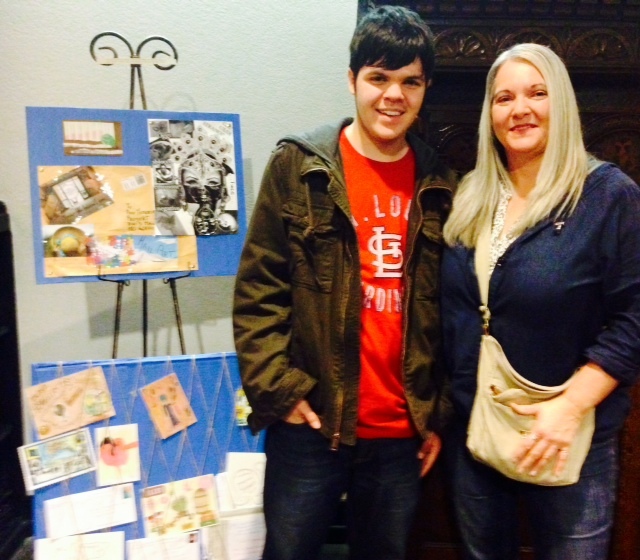 Today we had the opportunity to attend the exhibit, find our art work and view the many other Mail Art pieces. At the library I met Dayan and his mom…my daughter Elissa…and my sister Linda. Also attending were Dayan’s dad Kevin, stepmom Kim and his sister Emma and baby brother Eli. As we arrived, I was thrilled to see a large group in attendance at the reception. The event was also covered by at least two local tv stations. We had fun browsing the amazing Mail Art. I failed to get a picture of it, but there was on display a map of the world with pins marking where each entry came from. Art was mailed in from around the world and the art was as varied and interesting as the countries they came from. I loved that it was a hands-on exhibit and we were allowed to pick and examine the postcards. I loved too that there was a small table set up with materials so that visitors could create their own small work of art. Dayan’s little sister Emma made a precious Mail Art to take home. 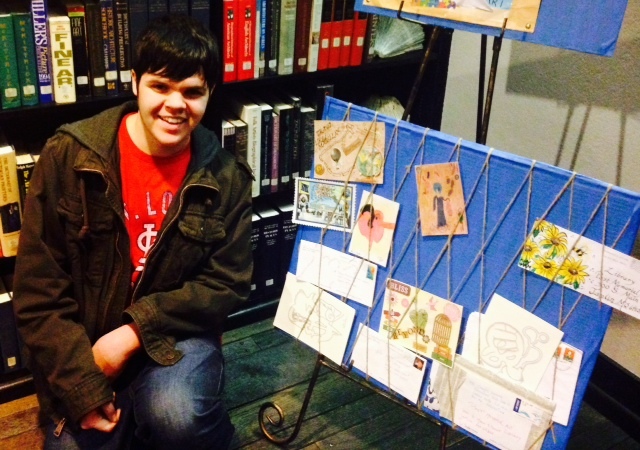 Dayan and I let our family members look around and see if they could find our Mail Art pieces. They discovered them quickly! Displayed near each other, it was a thrill to see our art work exhibited along with other creative and intriguing pieces. We discussed some of the more unusual Mail Art, like the one with a whole skull thrust through the postcard and the multiple card piece that was not only clever, but told a story. 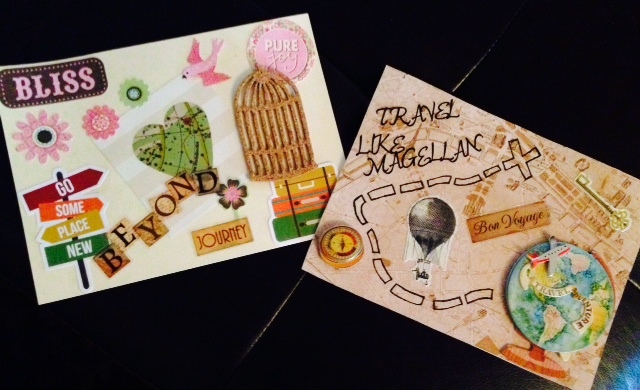 We had so much fun doing this Mail Art Projekt that we are entering mail art in another project, this one located in Austria. Those pieces are due in March and have a theme of Turquoise. Dayan shared with me his idea today for his Mail Art and it is incredible! He is way ahead of me. I know I’d like to use watercolors this time….and that’s all the planning I have done! 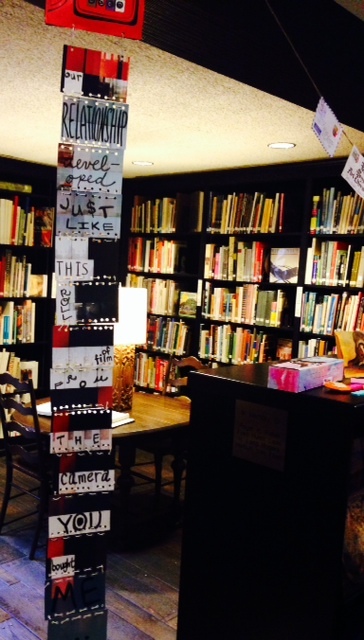 I am grateful for this opportunity that the Post Memorial Art Library offered. Dayan and I both hope they will make the Projekt an annual event, as we would like to continue to enter, and we’d love to continue to grow in our ability to create interesting and great Mail Art. The exhibit will be on display for the remainder of the month. Check out this fascinating collection of art.